If you follow along with me on Instagram, you have probably noticed that I have been in the very sloooowww process of revamping our entry way over the last couple of months. It doesn’t help matters that I keep starting new room projects before I finish what I have started. I sure hope I’m not the only one with design attention span disorder..
We just love the way everything came together and lightened up the entry. I should have done this years ago! I was so attached to my leather wall because it about killed me to do that paint treatment 800 years ago but it was way past time to lighten up the small space and update it. How amazing is that rug!! I have been obsessed with FLOR carpet square rugs for years and am thrilled that they are sponsoring today’s post. If you look at the “before” picture above, you’ll see that I previously had a FLOR carpet square rug in my entry. That rug has lasted years at the entry and it has amazed me because of all of the traffic and beating it took. I wanted another one because they are so incredibly durable and the patterns are all so pretty. 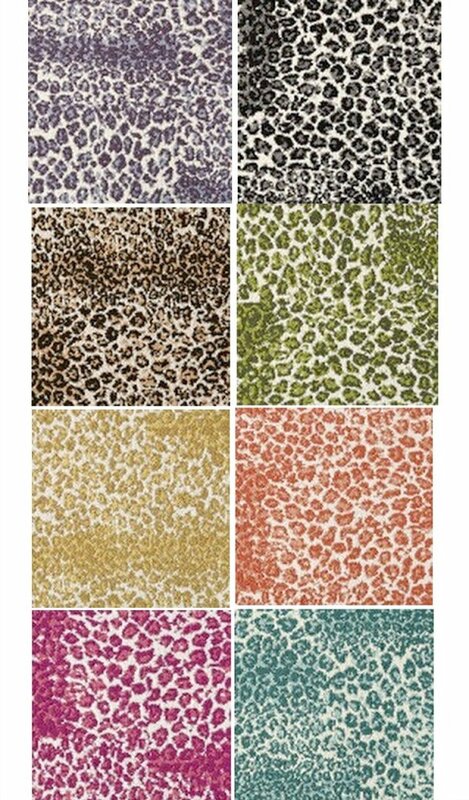 The best part is that they are inexpensive and they are perfect for those strange sized areas that it’s hard to find the right size rug. FLOR sent me the carpet squares and all I can say is that my jaw hit the floor when I unpacked the box and put the rug together. It is so bright and beautiful in person. I know that this rug will last us years. Oh yea! Someone has got to get that magenta color! I so wish I had a spot for it! Ha! “Spot” get it?? By the way, if you’re wondering how easy it is to put the squares together, they are a breeze. I put mine together in less than 20 minutes. FLOR sends these large adhesive circles that you use to attach the squares once you decide on the layout that you want. Once they’re all connected, as you can see, you cannot tell that they are carpet squares and those adhesives are like cement! 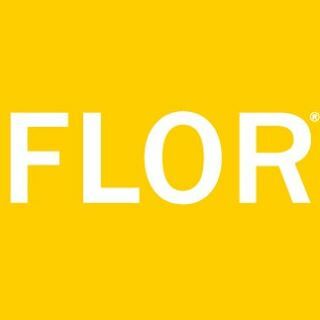 If you’re not familiar with FLOR Carpet Squares, be sure and look around at everything they have. So many great ideas and choices! 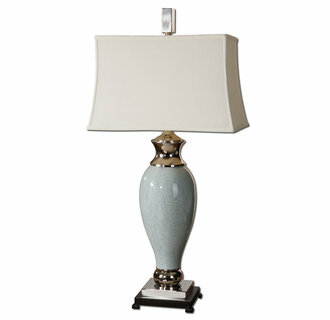 Uttermost makes the most beautiful lamps and while they’re a little more expensive, they are worth every penny because they are just so beautiful. 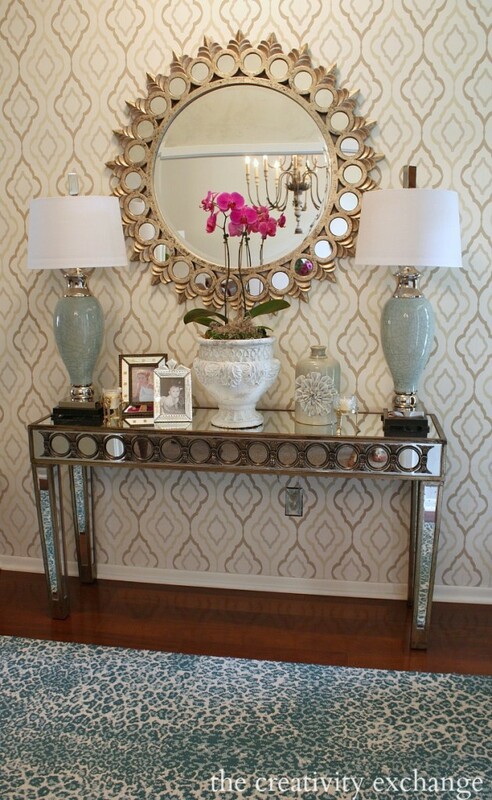 The wallpaper is made by Candace Olson and the pattern number is ND7083. You’ll notice that I only did an accent wall on the focal wall. I did a really pretty faux plaster treatment that was so easy to do on the walls throughout the rest of the space and I will share that technique next Monday for Paint It Monday. Thanks so much guys for stopping by! 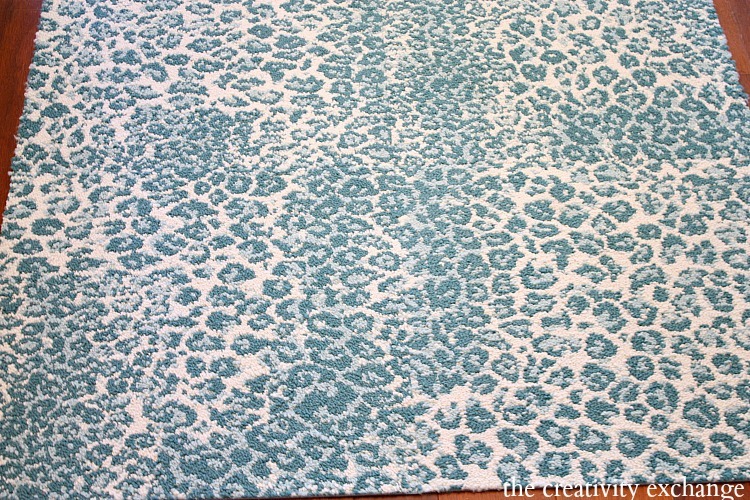 Thank you to FLOR Carpet Squares for sponsoring today’s post and for my perfect new rug! You guys are awesome and thank you for coming up with such an amazing product! OMG i love that rug! Thank you Ellen! Isn’t that rug just amazing! I cannot tell you how excited I was when I pulled it out of the FLOR box! It looked beautiful in the pictures but in person, it’s the most vibrant colors. Thank you Kiran! I bought the mirror at a local boutique and it did not have any vendor information on it. I sure wish I could figure out who made it. Beautiful! That mirror is beautiful (as is the wall treatment). and the rug looks fab! I’ve always wanted to try FLOR carpet squares – I love the idea of being able to swap out squares if they get stained – so smart! Thanks so much Jenny! You would LOVE the FLOR squares. I actually have them in several other areas throughout my home and have been so impressed with how well they hold up. WOWZA!! That entry is just GORGEOUS! Nice job, Cyndy. Wish I had just one room in my house that i could call “done” but I also have ADDD aka Attention Deficit Decorating Disorder . . . .
Ha! Yes, I am finally forcing myself to finish all of these projects. I have been driving my family nuts. Glad I’m not the only one who does this! Thanks so much for your kind words Laura! It all looks so beautifull, Cyndy! I cannot believe that those are carpet squares! They are fantastic. I love the pattern that you chose for them. You have such an amazing home! Thank you Megan! Yes, its so hard to believe when you put them together that they are squares. You cannot tell at all. My old entry way FLOR rug was a really light color and after several years, it still looked new. Great product. Thanks you so much Megan! Wow! What a beautiful & fresh update for your entry! I love it!! Awe, thank you Mila! Yes girl, we would be SO dangerous together if we were neighbors! LOL! Thank you so much for always leaving me sweet notes. Always makes me smile! Cheers! Simply Stunning! 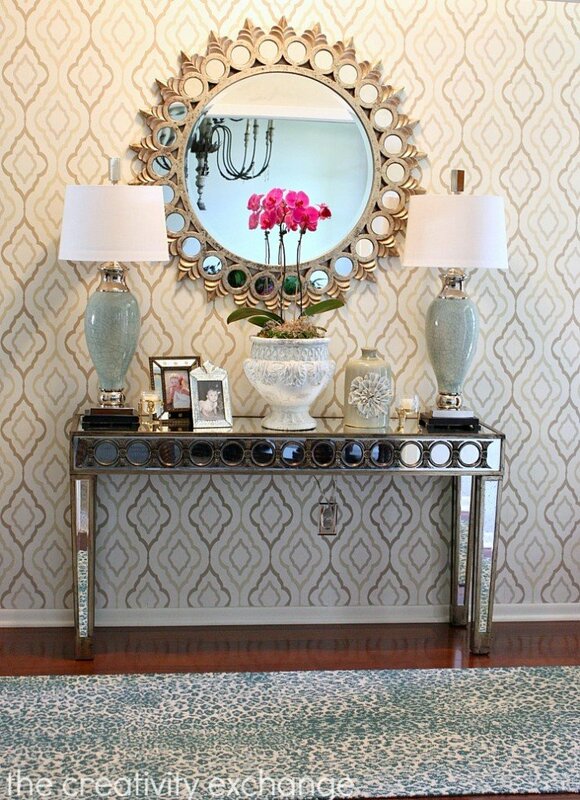 Love the lamps and that gorgeous rug. 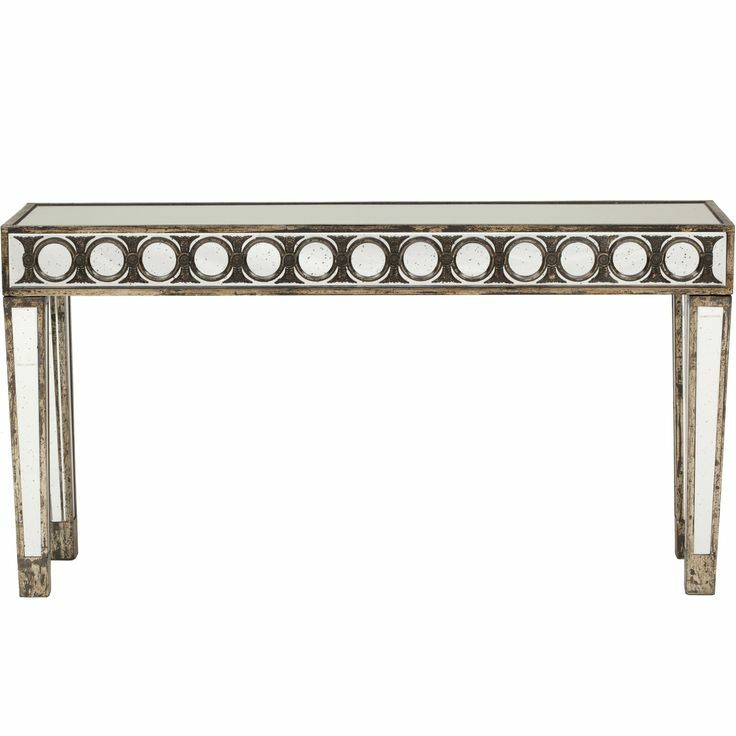 I know you had that stool in your old entryway and recovered it, but where did you get it originally? I LOVE it! I wish my house looked this put-together. I am in awe! I’m sorry, I didn’t mean for that extra bit to be posted at the end of my comment! I will try to remember to turn that checkbox off. Candace Olson wallpaper! What doesn’t she do beautifully? 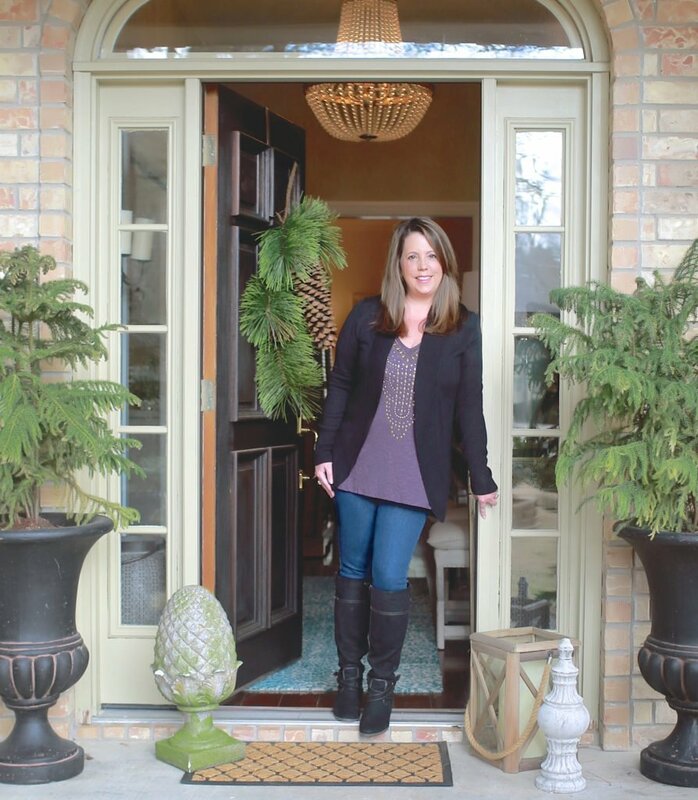 Every touch in your entryway is well thought out and spectacular! I love the way the Spot On turquoise carpet squares by FLOR pulled together the color in the adjacent room and those gorgeous lamps! Now, Cyndy, tell us, where is your touch of spray paint is. I was hoping you had a new technique for faux wallpaper. 😉 I’m really looking forward to next Monday’s post because I’m really tired of the chalkboard green walls in my foyer. As for never finishing one room or one project before you start another, Honey, you are not alone. I don’t know if it’s a sign of an overachiever’s ego, an attention deficit, or so many design ideas buzzing around that are impossible to resist. I prefer to think it’s the latter. 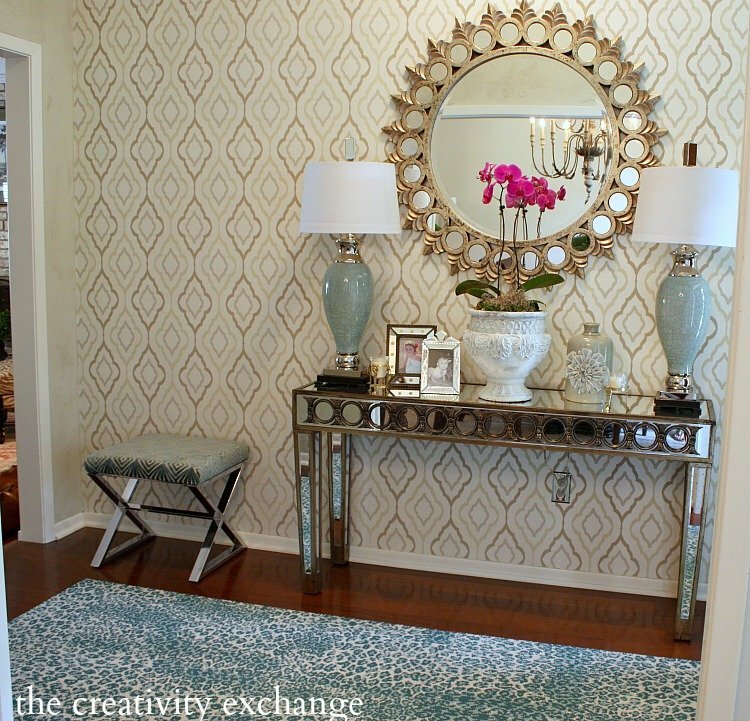 “I think I’ll just go ahead and order that wallpaper so I can hold it up to the light” and “Well, maybe I’ll just hang one piece to inspire me” and then “That other project can wait a little while because the entrance way will be a fast project.” Does that sound about right? That’s exactly how my projects go and I’m never bored. I love everything you did. It looks stunning. You are amazing !!!! Absolutely beautiful!! You’ve inspired me!! Absolutely beautiful! You’ve inspired me! Cyndy – it is stunning! 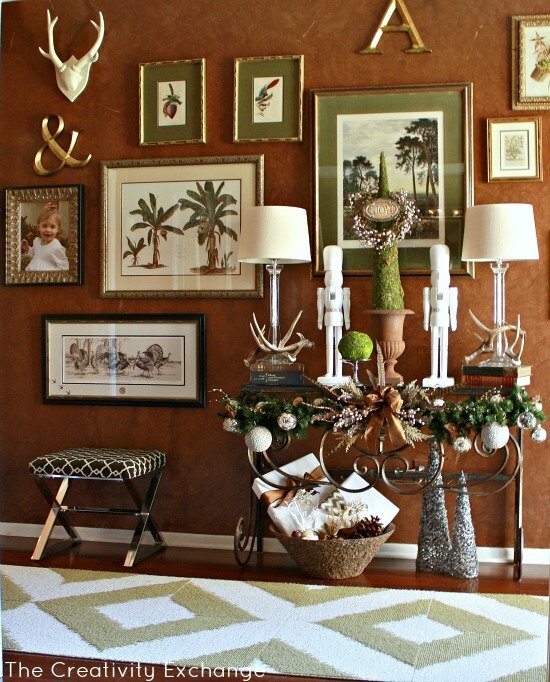 The walls, the rug, the accessories – I seriously love it all. Such a huge difference from the before to the after! 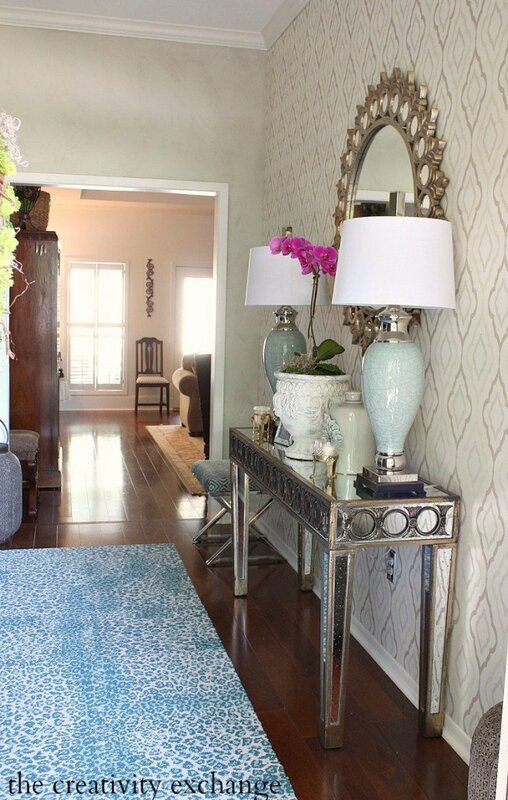 Cyndy I love the lighter and brighter feel of your entryway, the wallpaper and complimentary wall treatment and that gorgeous rug (rugs?) are show stoppers!!! It looks amazing! 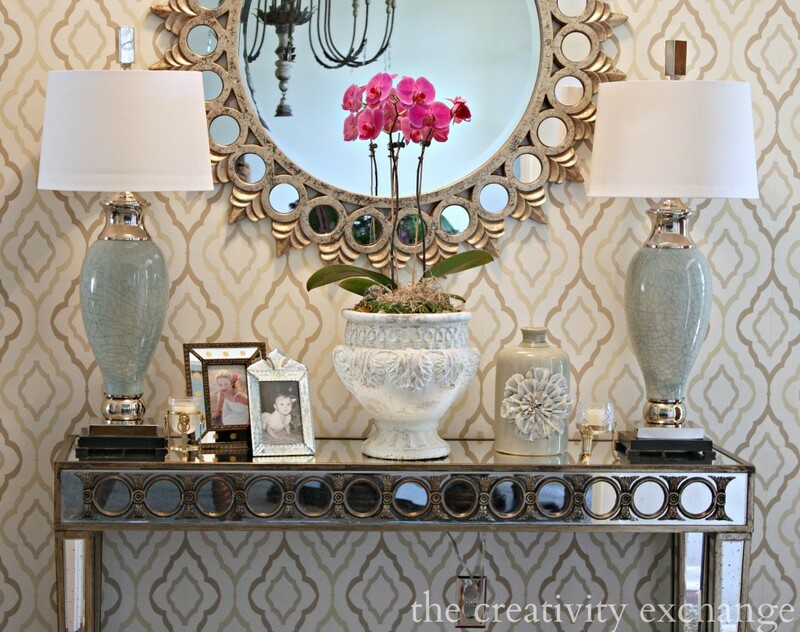 This is inspiring me to revamp our entry way. And what a difference that rug makes! Wow Cyndy, I would never believe that is the same space! Your makeover is amazing and so chic! 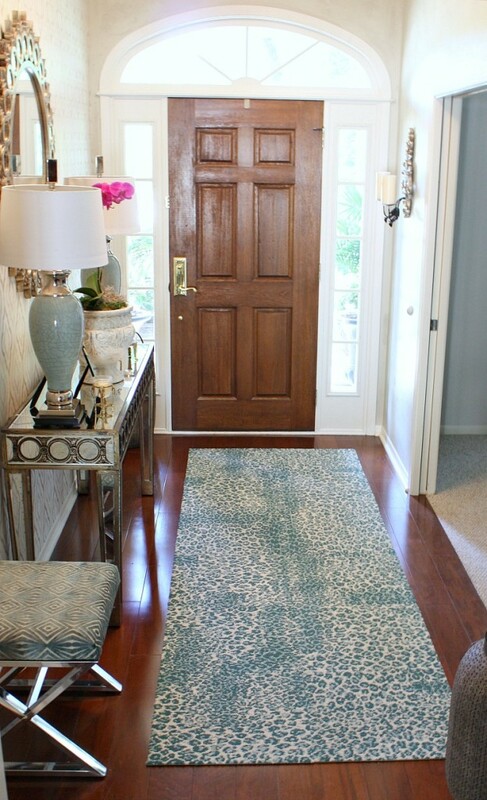 Those flor tiles are too cute and I absolutely love how you’ve styled your new Entry. 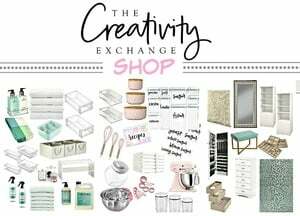 Thanks for linking up with us at Best of the Nest!